“People who come to worship here have been increasing over the days and months to such a degree that we have felt that there is not enough space on monthly service days. 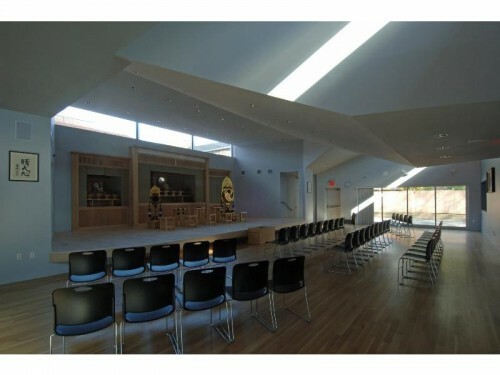 After the completion of the Multi-Purpose Hall at Mission Headquarters, unable to contain myself, I brought up the matter of a sanctuary construction with New York Center’s board of directors and, upon consulting with Bishop Motoo Matsuda, we received his approval to carry forward. That year, I returned for the Spring Grand Service in Jiba in high spirits. I approached Rev. Masahiko Iburi, Director-in-Chief of Administrative Affairs, about the prospect of beginning this construction. I was fully aware that in the lead-up to the 120th Anniversary of Oyasama, most construction projects not directly related to Church Headquarters would not be easily approved. Yet I believed it would be difficult if we allowed the present season to slip away. I appealed to Rev. Iburi with this in mind. Still, I did not immediately receive an answer. I was able to correctly deduce this would be his reaction. After a firm handshake with Rev. Iburi, I hurried to the Main Sanctuary and bowed deeply before the Kanrodai. At the Jiba of Origin, I figured that the total construction costs would be $1.5 million and we would be able to meet this only with the parental love of Church Headquarters. I resolved that the construction would be completed in time for the 30th anniversary of the founding of New York Center (2007). When we first announced the construction, we considered the possibility of relocating so we went around looking for suitable properties and buildings. However, after finding nothing suitable, someone suggested that we merely build a new building on our present location and we went with that. The fundraising finally began, but it did not proceed at the pace I expected. Followers tend to emphasize their vertical lineages with their churches and grand churches. Yet here I was trying to push forward a sanctuary construction with horizontal ties alone in New York, where the price of commodities is higher than anywhere else in the U.S.
During this time, one of our directors (yaku-in) who still owned property in Japan decided to sell it off and permanently move to New York. He made a large donation. With this momentum, I suggested to the board of directors that we make a $10,000 ri-date, or donation, as an expression of our resolve. At first, everyone seemed stunned, but they said if that was my intention, they would willingly comply with it. I made it a point to constantly talk about the construction by reaching back to the construction of Place of the Service in 1864 as an example for us to follow. I believed the way our forebears dedicated their sincerity, especially the spirit and attitude of Izo Iburi, was an example we had to live up to. I spoke of how a construction was not something that is done because there is money to do it, but something that must begin from nothing and emerge from an attitude that propels one’s sincerity forward. Jiba is a place to sow seeds and to exert our sincerity. I believe everyone understood me regarding this point. I carried the ri-date with a joyful heart when I returned to Jiba for the 2003 Autumn Grand Service. Then, the following year, the construction committee was inaugurated. We stripped ourselves to nothing when the reality of construction began to loom before us. In 2005, it was time to choose an architect for the project. The construction committee was split. We looked at the last two recommendations and took a vote. 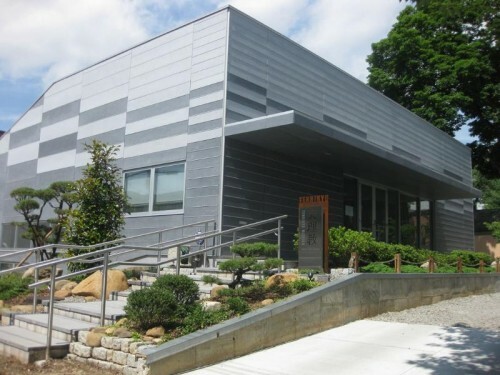 The first architect, Scott Marble, a professor at Columbia University, was someone we at New York Center knew for some time as he designed the Tenri Culture Institute (which houses a school of Japanese language, an art gallery and a space to perform music). The second architect was He Gin Lee, who designed several Korean Christian churches in Queens. His proposal would have cost us two-thirds less compared with Mr. Marble’s. When the votes were cast, Mr. Marble’s proposal won 11 to five, having gained the support of the younger crowd. Mr. Marble worked with the construction committee over the next six months. He was to design the building itself while Rev. 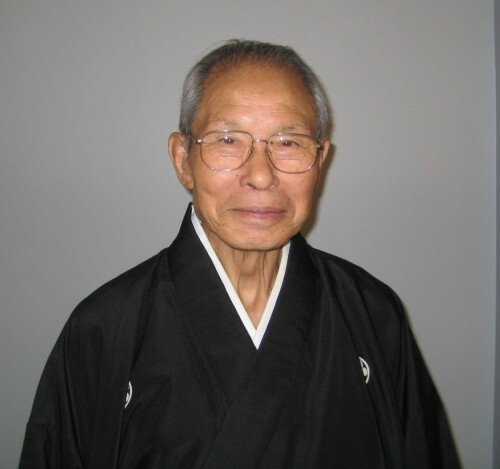 Jiro Morishita of Brotherhood Church was tapped to build the yashiro (shrines). 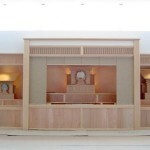 When designing the upper dais, Mr. Marble researched extensively and even studied the Tenrikyo teachings. In September 2005, he presented us with a simple blueprint and we presented this with a project proposal to Church Headquarters in time for the Autumn Grand Service in October. Ever since the inauguration of the construction committee, we strongly encouraged one another to solidify our unity of mind, devote ourselves to hinokishin, and serve in the cause of single-hearted salvation to bring the construction to a successful conclusion. With such a spirit I raced alone up to 2,000 and 3,000 miles irrespective that I was past 80. I devoted myself to sprinkling the fragrance and salvation work (nioigake o-tasuke) to stir up support for the construction. Further, someone at New York Center made T-shirts emblazoned with the calligraphy kansha (gratitude) and raised over $10,000. Yoboku sushi chefs volunteered their services and sold sushi at our naorai every month at fire-sale prices to help with the construction fund. 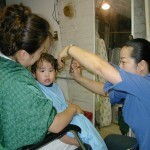 Another Yoboku, a beautician from faraway Virginia, gave haircuts before and after our monthly services to contribute to the construction fund. Through everyone’s sincerity contributed in this way, we achieved the goal of raising the $500,000 we resolved five years earlier, during the year of the 120th Anniversary of Oyasama. However, at the stage of choosing a construction company, the three estimates we received had far surpassed our proposed budget. The cost of construction materials had spiraled upward due to a construction boom in China and post-Katrina rebuilding in the southern U.S. The construction budget I had proposed was $1.5 million. Yet all the estimates were over $2 million. Once the designing costs, furniture, fixtures, and miscellaneous expenses were added up, it was over $3 million. Eventually, in July 2006, we signed a contract with company B to the tune of $2.3 million. The construction work was finally beginning. The first step was to tear down the north building and make it into a vacant lot. Yet asbestos was found in the roof. Law required us to dispose of it properly since it could release toxins. It took time for the application to go through and the ad hoc budget went up $75,000 to get it removed. Even after this, the electric company took a long time to come and cut the power. We waited two months. During this time, the north building came to house homeless people at night. A neighbor filed a complaint with the police and we were fined. Even when the electric power was finally cut off, we couldn’t immediately receive the demolition permit. It also took four months before we received the construction permit. Due to unforeseen issues such as these, it was not until February 2007 when the digging finally began. 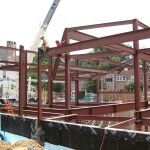 The steel structure went up and the sanctuary began to take shape. Everyone’s emotions were uplifted when this came into sight. Donations to the construction fund began to come from unexpected places. One devout Yoboku had been helping nurse a senior citizen and administering the Sazuke every day to her for the last two years. As she conveyed the teachings to her, the woman became inspired and consistently donated each month. When the woman passed away for rebirth, she bequeathed $30,000 to the construction fund in her will. The parents of a student studying in the area made a large donation out of their appreciation seeing that their son, who was frail while growing up, had grown healthy because of the judo training he received at New York Center. Further, one of our directors had been introduced to a retired Japanese-American professor who came down with Parkinson’s. This director of ours went to visit him to administer the Sazuke and when asked about how he planned to manage his assets after death, our director persuaded him how he could put some of them to use and ended up donating several tens of thousands of dollars. As the construction funds collected, unforeseen circumstances led to several change orders. A major one required us to add steel reinforcement to a neighboring building to prevent it from collapsing. The estimate was $90,000. I could almost feel the blood draining away from me when they told me. Yet miraculously enough, someone offered their sincerity. The construction proceeded and was paid for. In the end, there were more than 70 change orders to our contract. I thought, “A sanctuary construction truly befits being called a wondrous construction.” Along this spiritual journey, there were mountain highs and valley lows. A special feature of this sanctuary is that when you enter the worship hall, the many windows allow natural light to filter on the kandoko (altar) and worship area. There is glass placed above the shrines. When one sits in the worship hall and gazes up at the sky, one feels as if one were in the embrace of heaven and earth. This is the kind of worship hall it is. It took two whole years before we could savor the joy of seeing our completed sanctuary. Before we knew it, the funds toward the construction had more than doubled from what we originally resolved to $1.1 million. The completion of this magnificent sanctuary required the parental love of Church Headquarters and everyone’s sincerity. From this point onward with Rev. Toshihiko Okui as the core, let us move forward spiritedly in the cause of the world mission, with radiant hearts that befits this radiant structure.